While the Lucky Turtle has been the social media darling of this race, there are 2 pieces of technology that have added new dimensions to race followers. 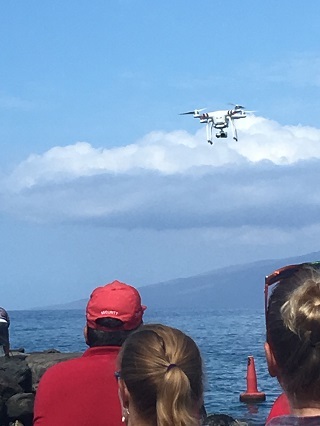 The fact that a drone can take and transmit photos 1000 miles from shore is amazing. Similarly amazing are the improvements in satellite tracking which allows the whole Finish Line process to be automated. The photography provided by Kraken's drone has simply been spectacular. So vivid and real were the images, particularly as Alex Malacek, the operator got more and more comfortable with handling it. YB Tracking solutions have been used by Vic-Maui since 2012. Deployed by Vic-Maui for the first time this year, YB Tracking's automated finish line service has given Race Committee the technology to run the finish line from the bedroom. All official times have been provided via the Race Tracker with the device sending a time just after the boat crosses a theoretical line on the globe. Combined with improved accuracy of time keeping, this will provide future race organizers much more flexibility to find the best place to finish races.